BEFORE FORMULATING DYNAMITE ANSWERS TO Interview questions, let’s review some basic Interview Preparation principles to prepare for the job interview. If you understand interview goals – i.e. both your goals and the likely goals of the interviewer – and the process by which you both will attempt to reach these goals, you will be in a position to formulate your own dynamite answers to interview questions. The job interview is much more than just answering a set of questions and preparing accordingly. It involves knowing about different types of interviews, various settings in which interviews take place, and a variety of interview formats and questioning techniques. You should prepare for all aspects of the interview by anticipating what lies ahead and how you should best present yourself both verbally and nonverbally. 1. Identify and assess your strengths. It is one thing to say that you enjoy talking to people. But to tell an employer you enjoy speaking in front of groups and have a flair for holding their attention and getting the action you desire from them, translates your skill into a job-related benefit for the employer. Whenever possible, give examples of your strengths that relate to the language and needs of the employer. While you have specific needs in relation to the job – salary, benefits, satisfaction – these are self-centred interests which should not be the major issues discussed with interviewers. Always put yourself in the shoes of the interviewer – he or she has specific needs. Keep focused on what it is you can do for the employer rather than what the employer can do for you. Most of your answers and questions should stress benefits you are likely to provide for the employer. When preparing for the interview, be sure to use an employer-centred language of benefits. Whenever you make a claim of your accomplishments, it will both be more believable and better remembered if you will cite specific examples or supports for your claims. Tell the interviewer something about a business-related situation where you used this skill and elaborate about the outcome. If it occurred on the job, stress the benefits to the company where you were employed. Try to identify four or five good work-related examples of your accomplishments which you may be able to share with the interviewer. Avoid talking about “what happened” when you worked in another organization. Your story needs a subject – you – and an outcome – a benefit or performance. 5. Identify what you enjoy doing. There are a lot of skills you may have honed to the point of excellence, but do you want to spend the better part of your work life engaging in this activity? When he was 95, George Burns claimed one reason he was still going strong and working a rather demanding schedule was that he loved his work! A secretary may have excellent typing skills but want to move up and out of consideration for another similar position. If this is the case, he doesn’t want to stress his typing skull – even though he may be very good at it. Skills you really enjoy using are the ones you are most likely to continue to use to the benefit of both you and the employer. Before you go to your first job interview you should have conducted research on the field in which you plan to work. Though some of your information may come from printed materials and electronic sources – reference materials in the library, company publications, or company websites – informational interviews with persons already working (or better yet hiring) in your field will yield the information you will need later. You want to know before you go for a job interview what range of salaries are offered in your geographical area for the kind of work you hope to do. Know what starting salaries are as well as the salary level for someone with your education and experience. Find out as much as you can about jobs in general in your field so that you can talk intelligently once you have a job interview. What are the duties and responsibilities? How far can one advance in this field? What kinds of special skills are useful? What training or degrees are required? 7. Gather information about the organization. Prior to going to the interview, do your research on the organization. Find out as much as possible about what they do, their reputation, corporate goals, management philosophy, the kind of people they tend to hire, whether they primarily promote from within – any information you can gather will be to your advantage. It will help you make decisions about your desire to be a part of their team as well as ask better questions and give better responses to those they ask you in the course of the interview. Most companies – both large and small – maintain company websites. These sites can provide a wealth of information on company operations, including directories of key personnel. You should supplement these resources by talking with people who work or have worked for the company. You can get a better assessment of interpersonal dynamics within an organization from talking with people. In the case of very small firms, your only source of information may be talking with individuals in the community. 8. Gather information about the interviewer. It is often said that organizations do not hire, people do. Thus, it is to your advantage to try to find out what you can about the person(s) who will be conducting the interview as part of your data gathering on the organization. What is this person’s background? What types of questions does he like to ask? What about his personality? Does he ask tough questions that put stress on interviewees? The more you know about that individual, the better you can phrase your responses in honest, but targeted terms. 9. Talk in the employer’s language. Talk in the employer’s language of organizational goals and expected performance. The employer is interested in getting the work done, getting it done in a timely manner, getting it done at a certain quality level, and getting it accomplished within budget. The employer is usually not interested in your career and personal goals except as they relate to your performance within the organization and the company’s bottom line. 10. Anticipate and prepare for questions. You can anticipate before you ever walk into the interview 90%-95% of the questions you will be asked. You can expect to be asked about your education and work experience as they relate to the job under consideration. You may be asked questions about your personality, work habits, ability to work with others, or your career goals. In addition to the standard areas of inquiry, a look at your resume should tell you if there are areas likely to get the attention of the interviewer. Do you have unexplained time gaps in your education or work life? Have you jumped around from employer to employer in a short time period? Are you applying for a position that is significantly below your apparent abilities and previous work experience? In other words, if there is anything that is likely to have come to the attention of the interviewer as questionable – either positive or negative – expect that you will be asked about it during the interview and prepare accordingly. It is far easier to think how you would respond in an honest, yet positive, manner to a question when you are in the relatively comfortable surroundings of the home than in the midst of a stressful interview. Gather the information necessary to respond intelligently to the questions you are likely to be asked, collect your thoughts, and plan strategies for responding to various likely lines of questioning. 11. Consider your response if asked an illegal question. We are happy to report that the incidence of employers asking illegal questions of an interviewee has declined significantly since the early days of affirmative action. However, it can still happen. Consider prior to the interview how you would respond if you were asked an illegal question or one inappropriate for the work setting or unrelated to the job requirements. Your options are to inform the interviewer it is an illegal question and you will not answer it; tactfully indicate that, since the question deals with an area of illegal inquiry, are they sure they want you to respond to it; indicate tactfully that although an illegal area of inquiry, you welcome the chance to respond to it; ask how the question relates to the job for which you are interviewing; or you may choose to answer the question without comment on its appropriateness. Choose an option with which you feel comfortable in terms of both your response as well as the likely impact it may have on a job offer. 12. Practice the form and content of your responses. Most people find it is good preparation to practice various responses to anticipated questions. This does not mean that you try to memorize answers – whether someone else’s or your own – but rather, after thinking through the basic strategy to your response, you try to verbalize an answer. Most people find it useful to go through this process several times prior to an interview. 13.Practice questions with a friend or tape recorder. Preparing for the interview in isolation of feedback information for evaluating your potential performance is likely to produce less than satisfactory results. Try to enlist a friend to help you prepare for the interview. You may want to roleplay – your friend becomes the interviewer and you the interviewee. Run through a practice interview session where you must do everything from greet the interviewer to answer specific questions and close the interview. Tape record your answers to questions and analyze them to see if you indeed stress your strengths and benefits to the interviewer. Do you provide examples and supports? Are your answers always positive in content? Are your responses employer-centred? Keep practising until you’re comfortable in answering/asking questions. 14. Prepare for different interview types and settings. As outlined in Chapter 2, you should be prepared for two types of interviews: informational/networking and employment. These may occur over the telephone or in face-to-face meetings such as the employer’s office, a restaurant, or in a social setting. If, for example, you are interviewed in a restaurant, be sure you observe proper eating etiquette as well as avoid ordering foods that can be difficult to eat, such as spaghetti or crabs. Your eating behaviour will be observed. How and what you eat may be as important to the interview as to how you answer the questions. And don’t answer questions with a mouth full of food! 15. Expect several interviews with the same employer. Many interviewees are surprised to learn they are subjected to more than one interview with the same employer. They normally experience two interviews: screening and hiring placement. The screening interview may take place over the telephone. You must be prepared for that unexpected telephone call in which the employer probes about your continuing interest in the position, your availability, and your job-related expectations, including, perhaps, salary requirements. The hiring placement interview is normally conducted in the interviewer’s office. But it may involve a one-to-one interview or sequential, series, panel, or group interviews. This process could take place over a one- or two-week period in which you are called back to meet with other individuals in a one-to-one, series, panel, or group interview situations. Each interview may probe a different level of your interests, abilities, knowledge, and skills. 16. Be prepared for different questioning techniques. While you may be prepared to answer direct questions with direct answers, some interviewers also include indirect and stress questioning techniques. For example, rather than ask ‘Do you have difficulty working with your employers,” they may ask ‘‘Why did you leave your last three jobs?” or “How did you get along with your last three employers?” Rather than ask you directly about your social status and financial situation, they may ask “Where do you prefer living in the community?” If a job involves a great deal of stress, the interviewer may ask you questions that put you under stress during the interview just to see how you handle such situations. For example, you may unexpectedly be asked “if we hire you and three months later decide you’re not the person we want, what are we going to do?” or “We normally don’t hire someone without a college degree. Do you plan to complete college?” You may very well be thrown questions that are designed to challenge what may be perceived to be your well-rehearsed interview script. Remember, interviewers will be looking for indications of your weaknesses by asking questions that elicit such indicators. 17.Know how you communicate verbally to others. Strong verbal communication skills are highly valued by most employers. They are signs of educated and competent individuals. Do you, for example, speak in complete and intelligible sentences? How’s your diction? Do you say going rather than ‘goin, ’’ ‘going to” rather than “gonna, ’’ “didn’t rather than “din’t, ’’ yes rather than ‘yea? Do you have a tendency to use vocalized phases “ahs” and “uhms” and fillers “you know,” “like, ’’ “okay”? How’s your grammar? Do you use the active rather than passive voice? Do you avoid using tentative, indecisive terms, such as “I think, ’’ ‘‘I guess,’’ “I feel”? Do you avoid ambiguous and negative terms such as “pretty good” or “fairly well” which say little if anything? They may even communicate negatives – that what you did was not good! 18. Know how you communicate nonverbally to others. How do you dress, groom, greet, shake hands, use eye contact, sit, maintain posture, use your hands, move your head, maintain facial expressions, listen positively, eat, drink, or enter and leave a room? These are nonverbal behaviours that may communicate more about your competence and personality than what you say in the interview. You may want to videotape yourself in a mock interview to see how well you communicate both verbally and nonverbally. You can Schedule your Mock Interview with GoApti and Get access to the automatically recorded interview session. Before you ever open your mouth to speak, your appearance has already made an impression. Since you never get a second chance to make a first impression, male it a good one. Make the first few seconds of the interview work for you by nonverbally communicating your class, professionalism, and competence. 20. Prepare your telephone area. Once you have made known your job search intentions – whether by sending out resumes, networking, or conducting informational interviews – you may receive a telephone call from an employer quite unexpectedly. I t may be a call to schedule an interview, but most likely it will incorporate a “screening interview.” Be prepared by keeping essential items related to this potential telephone interview in an area by the phone. Minimum supplies should include a pad of paper, pen, copy of your resume, and note cards or equivalent on which you have information on all the companies which you have contacted as part of your job search. 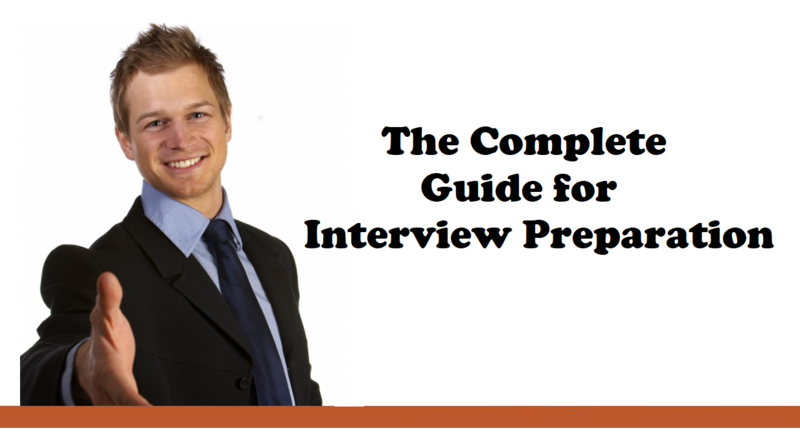 Many of the principles identified for interview preparation are also principles applied to the interview encounter. Others, however, specifically relate to the interview process. The following 22 principles will help you get through the job interview. There’s nothing worse than to arrive late for a job interview. Since the first five minutes of the interview are the most important, arrive five minutes late and you effectively lull much of the interview – and your chances of getting the job. Your tardiness will be remembered and in a negative light. Always try to arrive at least ten minutes early. If need be, drive to the interview site the day before to estimate how long it will take you to get there as well as find parking. Allow plenty of time, anticipating that you could well lose a half hour or more to bad traffic. 22. Treat everyone you meet as potentially important to the interview. When you initially arrive at the interview site, chances are you will enter a reception area, meet a receptionist or secretary, and be asked to sit in this waiting area. Other employees also may enter this area while you are waiting. Make sure you are courteous to the receptionist or secretary and anyone else you meet. Also, you should appear competent in how you greet these people, sit, and what you read. For example, you should greet the receptionist or secretary by introducing yourself: “Good morning. I’m Jane Morris. I have a 9 o’clock appointment with Mr Jameson.” Wait to be invited to sit in a specific place. If you are wearing an overcoat, tale it off before sitting. Interviewers sometimes ask these employees for their reaction to candidates: “What did you think about the candidate? Did you have n chance to talk to her? What did she do wide she was waiting to meet me? Do you think you’ll like her?” Employees’ opinions of such people can be very important to the interview process. So make sure you treat everyone you meet as important to the interview. 23. When waiting for the interviewer, do something that looks relevant to the interview and job. While waiting to meet the interviewer, do something that looks relevant to the organization and interview. For example, you might engage the receptionist or secretary in small talk concerning the organization, employees, and the interviewer. Try to learn something relevant to the interview. You might ask some of these questions: “How many employees work here? How long have you been with the cognization? Has Mr Jameson been with this company long? What did he do before moving to this position? How do most people like working here? What computer system do you use?” Don’t overdo it by becoming an interrogator or appearing self-centred by asking questions about parking privileges, vacation time, benefits, or office space. Your small talk should emphasize your interest in the organization as well as general information about the organization and interviewer relevant to the interview. You might learn something important that will help initiate small talk with the interviewer or raise a question you feel needs to be answered. You might want to raise certain questions with the interviewer if you were told in the lobby that there’s a lot of stress in the organization, many employees have left during the past six months, or not many people stay around here more than two years. That’s important inside information indicative of possible internal political and management problems you may want to question. It’s best to learn this now rather than become a victim of company stress or Byzantine politics. 24. Greet the interviewer properly. Chances are the interviewer will come out to the reception area to greet you. Stand up straight, shake hands firmly, maintain eye contact, listen carefully, look energetic, speak in the positive, and introduce yourself: “Hello, I’m Gaurav Gupta. It’s a pleasure to meet you.” Watch the small talk carefully. This is not a time to tell dumb jokes, look tired, or appear nervous. If you are asked if you had any trouble finding the place or parking, appear competent and positive by indicating you handled this part of the interview with ease. 25. Communicate positive behaviours during the first five minutes. The first five minutes of the interview, which may not even address job-related questions, are the most important to the interview. It’s during this time that critical first impressions are made, and interviewers decide whether or not they like you. And being likeable is one of the most important criteria for being selected for a job. If you make an excellent first impression from shaking hands and dressing right to handling the initial small talk – the rest of the interview may go extremely well as the interviewer helps you through the interview. He or she may have decided during the third minute that you should be hired. The questions and answers may merely reinforce these initial impressions. Make sure your perfume or cologne is applied in moderate amounts and jewellery has been minimized. You don’t want to be remembered for your strong scent or the noise your clanging jewellery generated! Indeed, many interviewers smell their interviewee as they pass in front of them when entering the interviewer’s room. 26. Wait to be invited to sit in a particular seat. The particular seating arrangement for the interview may be important to the interviewer. You may, for example, be asked to sit on the other side of a desk or table. Alternatively, you may be invited to sit on a sofa. Whatever the case, don’t look like you are in a hurry by taking a seat before you are invited to sit. Chances are you will be seated within six feet of the interviewer – a comfortable conversational distance for maintaining good eye contact. 27. Keep your hands, arms, and elbows to yourself. If you are sitting at a desk, keep your hands, arms, and elbows off the desk and away from any distracting items such as pencils or pens. Try to look alert, energetic, and focused on the interviewer rather than fidget with items that indicate your nervousness or irritating habits. If you don’t know what to do with your hands, try folding or steepling them. 28.Sit erect and lean slightly forward. Avoid leaning back in your chair or on the sofa looking extremely comfortable and relaxed. Such posture may communicate that you are more interested in talking about yourself than in listening to and learning from the interviewer. The best sitting posture is to sit erect and lean slightly forward toward the interviewer folding or steepling your hands. This is good listening posture. Nonverbally it communicates that you are interested in the individual. You will look more alert and energetic in this posture than in other postures. 29. Keep your feet on the floor. If you are sitting on a sofa where your full body is in view, avoid crossing your legs and showing the soles of your shoes. Keep both feet on the floor. Crossed legs still indicate a degree of informality and familiarity that is unwarranted at this point in your relationship with the interviewer. 30. Let the interviewer initiate the openers but take initiative in offering some of your own openers. It is the responsibility of the interviewer to initiate openers. During the first two or three minutes, the interviewer will probably talk about your trip to the office, the weather, your impressions of the facilities, or some other small-talk topics. Respond to these questions with more than just “yes” or “no” answers and observations. You need to take some initiative here to express your personality. Initiate your own positive small talk by making an interesting observation about the office, such as the artwork or decorating, or the personnel you met in the reception area. You might, for example, discover from seeing a framed degree hanging on the wall that the interviewer is a graduate of your alma mater. He or she may be a collector of unusual items that are displayed in the office. Or he or she may have an interesting photo displayed of family, friends, colleagues, a ceremony, or someone famous. Show some personal interest in the individual by focusing on one or two items for small talk. This small talk period may result in building an important personal bridge between you and the interviewer that will make this professional encounter a much easier and more enjoyable one. Remember, the most important impressions are made during the first five minutes. You want to appear energetic, positive, and interesting during these initial moments of the interview. In the end, how you handle yourself in the small-talk may be more important to getting the job than how you handle yourself with the standard interview questions. 31. Be prepared to respond to initial small talk in an interesting and positive manner. Small talk does count! It indicates something about your social capabilities which may be just as important to the job as your work-content skulls. Small talk does not mean telling jokes. It means developing a conversational line that has a purpose and establishes an agenda. 32.Answer questions with complete sentences and with substance. Avoid simple “yes” or “no” answers. Remember, the interviewer is looking for indicators of substance and benefits. Brief answers give little information about you. They may indicate a lack of interest or substance on your part. The interviewer should leave this interview saying “I feel good about this person. He gave good answers to my questions.” If you don’t answer the questions completely, how can this person feel good about you? 33. Reduce your nervousness by practising a few stress reduction techniques. You can better control your nervousness by following the same advice often given to public speakers. As you walk into the interview room, try to take slow deep breaths. You can do this subtly, so the interviewer will be unaware of it. And although this is easier said than done, the more you can get your mind off yourself and concentrate on the other person, the more comfortable you will feel. If you are nervous, you are probably focusing too much attention on yourself. You are self-consciously concerned with how you are doing and what impression you are making on others. Try to be more other-directed. Rather than concentrate on your needs and fears, concern yourself with the employer’s needs and questions. Preparation is probably the greatest aid in lessening nervousness. If you followed Principles 1-20 and arrived on time (Principle 21), you should walk into the interview feeling well prepared and confident. If you arrive early for the interview, you will have a chance to collect your thoughts, take those deep breaths, and focus your attention toward the employer. 34. Focus on the interviewer ‘s needs. Assume that most interviewers need to select someone who will fit into their organization well in terms of both productivity and personality. You must confirm during the interview that you are both a productive and personable individual. You do this by stressing your benefits for the employer and handling well the questions and small talk so that in the end you will be evaluated in the most positive manner possible. 35. Focus on exchanging useful information about each other rather than just on getting the job. Keep in mind your objectives and goals. Remember, both you and the interviewer need to acquire information that will best assist each of you in arriving at a proper decision. If you focus all your answers and questions on making a “good impression” so you can get the job, you will probably be very nervous and make mistakes along the way. Take it easy and focus on what you should really be doing – giving and gathering information that can be used for making a decision. In your case, you need information on the job, employer, and organization. Is this really the place you want to work? Will it be right for you? The employer also has similar questions about you. You want both the content of your responses and the manner in which you phrase your answers to be positive. As you talk about your previous employer(s), try to cast them in as positive a view as possible. After all, if you talk negatively about a former employer, the prospective employer will assume that someday you’ll talk that way about him. If you bad-mouth your former company, the employer will expect that one day you’ll do the same to his. If you have only negative remarks about your co-workers, he must question your ability to get along in his organization as well. In other words, you have little to gain – and much to lose – during the stupid – as you phrase your responses. Avoid negative words like “can’t,” “didn’t,” “wouldn’t,” and phrase your answers with positive words instead. Rather than say, ‘‘I wouldn’t want to travel more than 4-5 days per month,” you could respond with a more positive, “I would prefer to keep my travel to 4-5 days per month.” Practice being more positive in your day-to-day communication and you will find it will come to you more easily in an interview. 37. Turn potential negatives into positives. While interviewers also want to know what’s wrong about you – your negatives – you want to continuously stress your positives – what’s right about you. You can do this by maintaining a positive orientation toward all questions. Most applicants, for example, have some qualification or lack of qualification that they, as well as potential employers, may consider being a negative which is likely to knock them out of consideration for the position. Perhaps you are just out of school and hence don’t have experience. Maybe you are over 50 and, although you know it is illegal for an employer to discriminate against you on the basis of your age, you believe this will be a hindrance to your getting a job. Perhaps you have not stayed in your past jobs for very long and your resume shows a pattern of job-hopping. Maybe your grades in school were average at best. 38. Engage in positive nonverbal cues. Studies of the employment process indicate that 65-70% of a hiring decision may be based on nonverbal communication. Nonverbal messages – your appearance and dress – are the first to be communicated to an interviewer. The enthusiasm in your voice and animation in your face indicate your interest in the job as well as suggest an energy level conducive to getting things done. Your eye contact with the interviewer helps establish rapport and maintain interest. Because nonverbal messages are much harder to control, people tend to believe nonverbal messages over verbal ones. So male your nonverbal communication work for you. Pay particular attention to your dress, accessories, make-up, scent, handshake, facial expressions, eye contact, sitting, and listening behaviours. 39. Be sure to ask questions. Be prepared to ask several questions relevant to the job, employer, and organization. These questions should be designed to elicit information to help you make a decision as well as demonstrate your interest, intelligence, and enthusiasm for the job. You may want to write out several of these questions on a 3×5 card to help you remember the questions you want to ask. It’s okay to refer to the card during the interview. Just mention to the interviewer that “I have a few questions I wanted to ask you. I made some notes so I would be sure to ask them. ” Then take out your notes and ask the questions. This indicates to the interviewer that you are prepared and has specific concerns he or she must also address. We outline several of these questions in Chapter 8. However, avoid asking questions about salary and benefits. These questions are too self-centered at this point. They are best left to the very end – once you receive a job offer and begin negotiating your terms of employment. 40. Delay salary considerations as long as possible. Determine the worth of the position. Demonstrate your value to the employer. You can only do these two things after you have had a chance to interview for the position – not at the beginning or in the middle of the interview. You need to have the opportunity to determine what the job is worth based on the duties and responsibilities of the position – something you can best evaluate after you have a chance to ask questions about the position. You also want the opportunity to promote your value to the employer which you have a chance to demonstrate and support during the give and tale of the interview. Interviewers who bring up salary early – during a telephone screening interview or early in the initial interview – are usually trying to screen people out of consideration based on salary expectations that are either too high or even too low! Attempt to stall by indicating that salary is “open” or that you need to know more about the position before you can discuss salary. 41. Delay accepting an offer until you can consider it. Once you are offered the job, your immediate response may be to accept it right there on the spot. In most cases, you are better off to request at least a day or two to consider the offer. This gives you a chance to weigh whether you really want this job; check your status at any other organizations where you have applied for a position; and perhaps to even negotiate a better employment package either with this employer or at one of the other firms, which may decide that if they want you they will have to act now. It is reasonable to ask for 24-48 hours to consider the offer as well as discuss it with other family members. If a geographical move is involved, a longer period of time is not unreasonable. 42. Close by asking when to follow up. At the end of the interview make sure you know what the next step is – further interviews or an employment decision – and when the employer expects to make a decision. Once she indicates a hiring decision date, ask if you may call a day or two after that date if you have not yet heard. If she says they expect to make a decision by the loth, ask, ‘‘If I haven’t heard anything by the 12th’, may I call you to check my status?” In most cases, you will be given an okay to call. Now you know the date by which you should start calling, and it will be easier for you to place the call since you have provided the entre. The interview is not over when you shake hands and leave the interview site. It’s over when you get and accept the job offer or another applicant is hired. Therefore, plan to do additional things during the post-interview period to enhance your candidacy. 43.Record information about the interview for your future reference. Often you will have more than one interview – probably a series – with a company. Male notes while the interview is fresh in your mind, within 24 hours after you leave the interview. Include the name and position of the interviewer(s), information about the job (duties, salary) – anything pertinent to the position, your qualifications for the position which you stressed in the interview, and any other information you may need later. You will have a summary of the interview which you can review prior to a future interview with the firm – whether a follow-up interview for this same position or another opening at a later time. 44. Send a thank-you letter. As soon as possible after the interview – later the same day or the next day at the latest – send a thank-you letter. In this letter express your appreciation for the time the interviewer(s) spent with you, indicate your continued interest in the position (if this is the case), and restate any special skills or experience you would bring to the job (keep this brief and well-focused). This is a business letter and the stationery, format, and method of writing should reflect your professionalism. 45. Follow through with a telephone call when the decision date has passed. Remember at the end of the interview you asked when a decision would be made and asked whether you could call if you hadn’t heard within a couple of days of that date? Don’t just ask the question and leave it at that – you must follow through. If the decision date has passed you must make the follow-up call. If no decision has yet been made, your call will remind them of your continued interest. You also should impress the employer as someone who does follow through, and he could expect this same commitment from you as an employee. If the employer has made a decision and was about to call and offer you the position, that’s great! If someone else has been offered the job you may be disappointed, but it is just as well to find out now and concentrate your job search efforts elsewhere than to waste your time waiting to hear about this job. If you put all of these interview principles into practice, you will be in an excellent position to get the job. You will approach the interview with confidence, energy, and enthusiasm. You will impress the interviewer as someone she would like to have working in the organization.